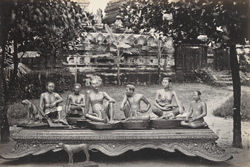 Photograph of carved wooden figures at Rangoon (Yangon), taken by J. Jackson in c.1868, part of an album of 43 views of Burma (Myanmar) from the Sladen Collection. The Burmese have an ancient tradition of woodcarving, at which they excel both technically and aesthetically. The medium is used in royal and religious architecture, where carved wooden decorative elements are a characteristic feature, and in sacred and secular sculpture, such as these carved and painted wooden figures, arranged on a large and ornate plinth. They are vividly naturalistic in style, their postures relaxed and expressions animated, and may represent a family group.